Interval Training For Figure Competition Will Maximize Your Fat Loss! For years, marathon cardio sessions were 'mandatory' for women who wanted to lower their body fat for competition. The following two methods will maximize fat loss during your pre-contest training. Learn more. For years, marathon cardio sessions were &apos;mandatory&apos; for women who wanted to lower their body fat for competition. These sessions were long and boring... nothing like 2 hours on a recumbent bike! No one seemed to notice that athletes who trained using short duration, intense workouts (such as sprinters) were leaner and more muscular than athletes who did much higher volumes of cardio (ex. long distance runners). "With Low Intensity Training The Metabolism Returns To Normal Shortly After The Exercise Session Ends." Research now shows us that higher intensity training, such as interval training, can deliver the same results in much less time than traditional longer duration cardio sessions. The first major study was conducted in 1985. The American Journal of Clinical Nutrition determined that high-intensity training increases metabolism for up to 24 hours after training. "Short term intense interval training is highly effective in altering the ratio of lean body mass to fat without compromising muscle size." -Dr. Patrick O&apos;Shea, (Quantum Strength and Power Training, Gaining the Competitive Edge). With lower intensity training (steady-state cardio) metabolism returned to normal shortly after the exercises session ended. (It is now an accepted fact that the rate at which you burn fat depends more on how many calories you burn in the hours following your workout as opposed to the number of calories you burn during your workout). As recently as December 2006, researchers at the University of Guelph in Canada found that two weeks of interval training done on alternate days can increase metabolism by 36% in women. Do You Prefer Low Intensity Cardio Or Interval Training? 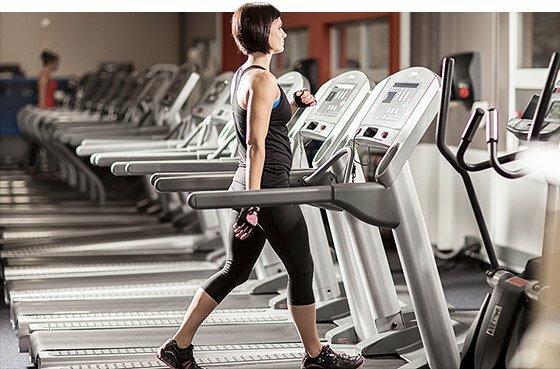 Interval training is characterized by short, intense speed/effort increases during your cardio session, followed by longer duration &apos;recovery&apos; period in which you return to your usual pace on whatever piece of cardio equipment you are using. For example, let&apos;s say you normally run at 5.0 on the treadmill for 40 minutes. To introduce intervals into your session, you would (once you are warmed up) sprint for 20-30 second &apos;intervals&apos; (at a higher speed than your usual 5.0), then reduce the speed back to 5.0 (or slightly lower) for 2-3 minutes, depending on your conditioning. 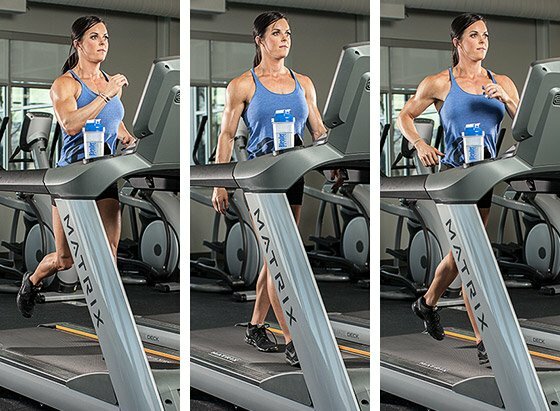 This would be repeated for half of your normal cardio time (20 minutes). That&apos;s all there is to it, It seems simple but if you&apos;ve never tried it, be prepared for an extremely intense workout. Research shows that proper interval training can get you the same results in half the time of steady-state/lower intensity cardio. This can be done on any piece of cardio equipment. The spin bike is excellent for intervals because of the ease at which you can control the speed/tension. You should be out of breath at the end of each interval segment. If you can talk comfortably, you are not pushing yourself hard enough! Just remember to take it easy while you are a beginner. Training at this intensity is only for women who are in superior cardiovascular condition. The worse thing you can do is to rush the process and burn out. I&apos;ve seen this happen far too many times! Look in many exercise magazines for women and you will see workouts that call for 2 or 3 sets of 15 reps per set. A few sets and fifteen reps may be good for someone trying to get or stay in shape, but for a figure competitor trying to lose body fat and keep as much muscle as possible; it is not the most efficient way to train. "To introduce intervals into your session, sprint for 20-30 seconds, then reduce the speed back down for 2-3 minutes, then sprint for another 20-30 seconds." What Is High-Intensity Resistance Training? Studies show that higher intensity weight training (lifting heavier weights in the 8-10 rep range) is more effective at burning calories and keeping metabolism elevated, in the hours following your workout, than higher rep training. The key to fat loss is this continued elevation in metabolism, which continues for 16-24 hours after a high intensity workout. Lower intensity/high rep training and low intensity cardio do not keep your metabolism elevated in the hours following a workout. With lower intensity forms of training, your metabolic rate returns to normal shortly after the workout is finished. This dispels the myth that high repetition training is the best way of getting &apos;cut&apos; for a competition. Related Video Perfecting Your Figure! These are the two most important goals a figure competitor has during the pre-contest phase. Use weights that only allow about 8 - 10 repetitions (for most sets - but there are some higher rep exercises such as jump squats which are great for maintaining muscle size and send your heart rate through the roof). Choose multi-joint exercises. These are exercises that require the use of many muscles to execute, such as plyometric pushups or walking lunges with bicep curls. This is a very demanding way to train. The heavy weights will maintain your muscle size while the choice of exercise and the circuit format keeps your heart rate high. The calorie burn is tremendous. I have trained competitors who used this as their only form of cardio to prepare for a show! If you are not used to this type of training, take it easy at first. High-intensity training places great demands on your body. Proper form is very important because you will become exhausted while performing these exercises and it&apos;s easy to get sloppy and lose focus. "Be sure to use a weight that only allows 8-10 repetitions per exercise." The combination of interval training and high-intensity weight training is the most effective way to decrease your body fat percentage before a competition. When performing intervals for the first time, decrease the time you normally perform cardio by 50%. Work hard and as your conditioning improves and you get closer to competition, increase the length of your cardio (interval) sessions. The same goes for your resistance training. Reduce your normal workout time by 50% if this is your first time trying this type of circuit training. As your body becomes more conditioned, you can increase the length of your workouts. You will actually do more &apos;work&apos; in these shortened sessions than you did in your longer ones. Terry is a figure competition coach whose goal is to help women change their lives through motivation, training and much more.